Plenty has already been written — and will continue to be written — about how Mitt Romney blew his chance to unseat President Obama despite a stagnant economy. His campaign’s gaffe-filled attempt to harness one of the transformative technologies of our time surely didn’t help. 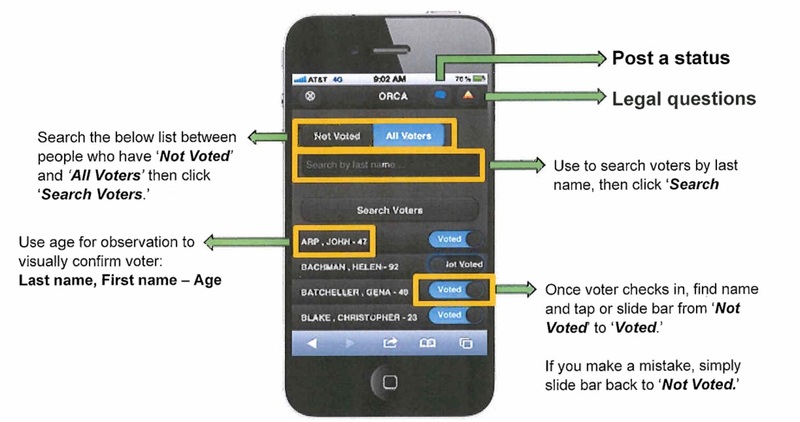 Project Orca, the Romney campaign’s mobile strategy to equip an army of loyal volunteers with tools to help measure voter turnout, generated more stress than it did votes for the Republican candidate. As detailed by Romney volunteer and web developer John Ekdahl on his blog and further explained by other reports, Project Orca was untested technology foisted upon volunteers at the last minute with very little practical training. The idea was a good one: campaigns have for years monitored voting in cities and towns across the country to see whether or not people expected to turn out for an election actually vote. Campaign volunteers watch polling places to see which registered voters show up, with the intention of encouraging the ones who had yet to vote to get down to the polls through a phone call. It’s usually a pen-and-paper affair, but Romney’s campaign wanted to automatically collect that data from its volunteers to get a better sense of where to direct its get-out-the-vote team. Many volunteers didn’t realize that they were being asked to use a mobile website, not an app. Those who did realize it was a website didn’t necessarily understand that they needed to use “https:” for secure browsing on the site, and got a blank webpage because the campaign didn’t forward the regular unsecure URL “http:” to the secure site. PINs issued to volunteers simply didn’t work in Colorado. The campaign’s data center was poorly designed and collapsed under the weight of all the attempts to connect to the Orca system. There are plenty of lessons here for future campaigns. For starters, it’s still an app-focused world: one can understand the campaign’s desire to build a system that could work on any smartphone, but its volunteers still expected that they were going to be using a mobile app. If you’re not directing people to an app, you need to make it very clear, and you need to figure out a way to let your volunteers test it beforehand. It’s also clear that Election Day is probably not the best day to roll something like this out at a grand scale. With dozens of primaries leading up to a typical election, there was plenty of time for the Romney campaign to test this out on a smaller scale before the big day. Still, mobile strategies such as Project Orca are definitely the future of campaigning. Had this system worked, the Romney campaign could have had a real-time picture of how and where its supporters were voting. That could produce some fascinating data for the next wave of political data scientists to crunch. Wow. I thought Orca was just the codename for the app. I didn’t think they’d actually put it up there up top. Imagine being approached by a Romney volunteer who starts tapping into into their iPhone after asking you questions. When you ask them what they are doing, they show you this screen that says, “Orca” on top. That would be unsettling. I am both fascinated and mortified that the GOP is “spying” on the polling place to see who voted. Are they recording license plates? Are they taking photos with a zoom lens? Are they allowed to see the list of who checking in? Do they required registered GOP members to notify them when they vote? BTW, I’m 58 years old & IT is my second career: it’s not difficult; I just didnâ€™t bury my head in the sand over the past 20 years. Just another small example of not being able to solve a problem with the same kind of thinking that caused it in the first place..
Clearly the head of communications was selected from a binder full of potential candidates. How long will it be before implementation experience of the kind of tools they were seeking to utilise will move someone from the back of the binder to closer to the front I wonder? Big Data and all that goes with it is powerful, transformative and deservedly having its moment – but all those doing a parade lap on how much it made a did/didn’t make a difference in this election are probably mistaken. It was close — and with the exception of 2008, the last several General Elections have been close. Surely the very fact that it’s close means that accurate data would make an even larger difference? Getting out 100 voters won’t matter if you’re winning/losing by 12 million votes, but in a battleground state with a razor thin margin, finding those 100 voters is going to be absolutely crucial, isn’t it? Sounds like gross incompetence by the I.T.staff… not Mitt.